After a short history in the development in Disc manufacture, disc cutters and related equipment Presto entered the Tape machine Business in about 1948. 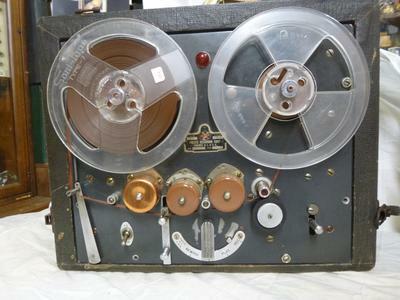 One of the Early machines dating from 1949 is the A 900 6 which was available with two differing electronics-as the 900 (shown) had a larger full size VU meter. The 900-R 7 transport was also available in a R 10 version which could take 10" reels. Presto's last machine that debuted in 1957-8 was the A 908 which was available in Stereo as well as 1/2 track mono. 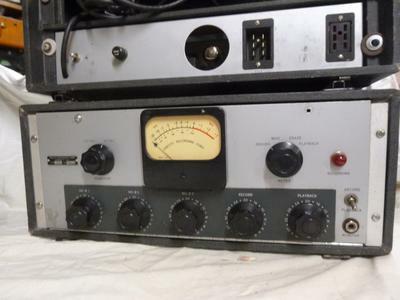 Presto was finished by 1965-ending a long history of recording equipment. 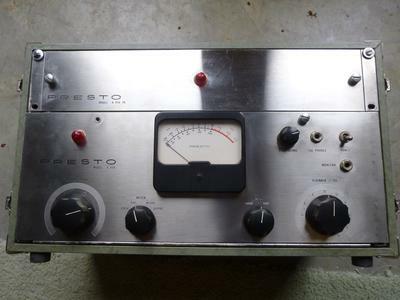 Your Presto board creation was typical of many of the engineering "masterpieces" that were created by the then ever present CE at radio stations across the US. Truly a bygone era ! My grandpa owned a Presto. Which I received after his death. This was a great machine. And to have a 3 microphone, 1 line level, mixer. This was a full production recording studio in a box. Well before our laptop computers. When the transport finally died. Around 1971. I converted the electronics mixer section. Into a live, radio station, radio console. Modified to include, cueing, on/off switches, audition output. It was an awesome beast overall. I dearly miss it. Those prestos are beautiful ! Reminds me of my early days recording .